Yazing brings together the best features of influencer monetization platforms, cash back shopping portals, and coupon code & deal sites into one easy to use platform, but because we are different than the typical sites that just offer one of these models, it can create some confusion as to exactly who gets paid for what. Each brand set’s their own commission rate on what they are willing to pay for a transaction. This can be something like 20% per sale, $10 per signup, etc… There is only one cash reward paid for each transaction. There are two kinds of shoppers that come to a brand’s deal page on Yazing. The average online shopper that is looking for a great deal or coupon code (this is the majority of the internet shoppers) and the smart Yazing member, who understand that they get these deals and also claim the cash reward for themselves as additional cash back on their purchases. 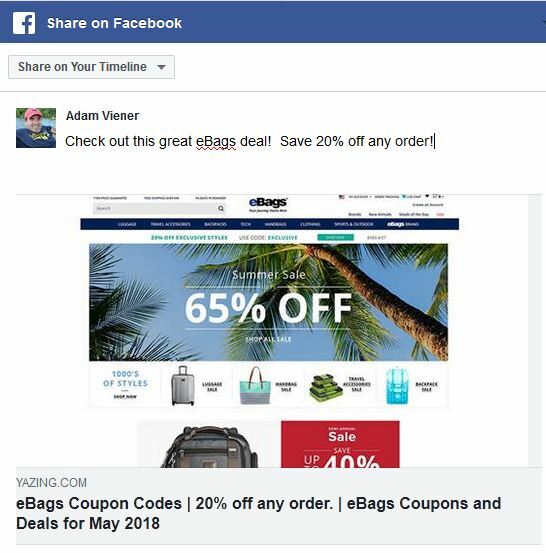 The major coupon code and deal sites make all of their money catering to the average online shopper by presenting them with deals and coupons and claiming the available commissions for themselves. When we came up with the concept for Yazing, we wanted to give this same power and money making opportunity to all of our members so they could easily earn these commissions promoting these deals for any brand on our site. The easiest way to see how this works is by looking at a brand’s deal page from both the perspective of a logged in Yazing member and from the perspective of a shopper who has come in through that same member’s referral link. Here is the eBags page from a logged in Yazing member’s perspective. Notice at the top right next to the brand’s description you see the member’s profile picture, the cash reward details, and promotional links for sharing and making money. The logged in member currently earns 18% of each eBags purchase. So there is only one commission available on a purchase, 18% in this case. 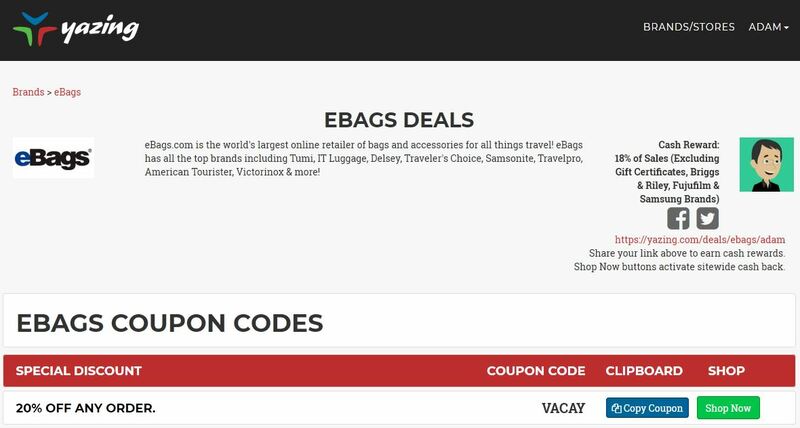 The 18% commission is either paid out to the logged in Yazing member or to the Yazing member who referred the shopper to eBags deal page. This makes Yazing not only the best platform to save money on your purchases, but also an online ATM machine for anyone who can promote great money saving deals online. This is how influencers use Yazing to make money and it’s a fantastic zero risk and zero investment money making side hustle opportunity for everyone!